Twitter is still getting a lot of negative press and weary forecasts in the English speaking world but none of that is relevant to Japan, which is consistently one of its strongest markets. In 2017, Twitter added another 5 million users to its Japanese network. 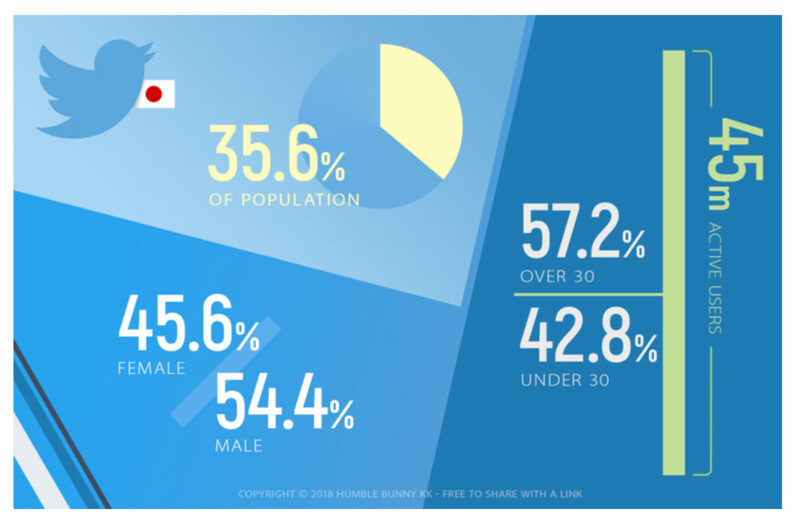 Twitter is the most diverse social network in Japan in terms of age and gender. There is a substantial showing of males and females among all age ranges on the network. Though previously dominated by teenagers, the network’s overall demographics have leveled out. Now, according to survey data, only 43% of all Twitter users are under the age of 30. Twitter is definitely the place to go if you have a message for the masses in Japan. Similar to other countries, Japan’s most popular Twitter accounts mostly belong to celebrities. Twitter Japan’s top company accounts include weather sites, newspapers, convenience stores, and mobile games. Being that print media is still quite prevalent in Japan, many companies are integrating Twitter with cross-channel campaigns. It’s common to see campaigns that start on print and migrate to Twitter to continue the conversation. Twitter is also a great way to quickly and easily update customers on the day-to-day (i.e. Today’s lunch special for a restaurant). This can be a quick alternative to making such updates on a website. The channel also doubles nicely as a customer support component, to engage and improve your ever-important service strategy in the Japanese market.